The incredible new Akiles FlexiPunch-E is a versatile modular binding punch that is designed as an affordable option for offices that need to use multiple different styles of binding. In fact, it is the least expensive modular electric binding punch available on the market. The FlexiPunch-E allows you to create up to four different hole patterns using easy to change modular punching dies. That means that you can bind a document with spiral coil, then minutes later you can do a project with either wire or comb binding. One punching die of your choice is included with the FlexiPunch-E binding machine and additional die sets are extremely affordable allowing you to expand your machine at any time. High Volume Punching Capacity: The heavy duty electric punching mechanism can handle up to twenty sheets of 20lb paper per cycle. 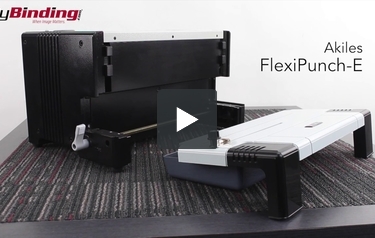 Plus, the FlexiPunch-E offers a foot pedal control that allows for two handed punching. Heavy-Duty Punching Motor: The FlexiPunch-E offers a heavy duty commercial quality electric punching motor that provides more than enough punch power for all die sets and punching patterns. Fully Disengageable Punching Pins: Allows punching of all paper sizes without partially punched holes at either end. Anti-Jam (Reverse) Feature: When sheet overload is detected or a paper jam occurs, the FlexiPunch-E automatically stops the punching cycle and retracts the punching pins. This will help you to avoid downtime. Heavy-Duty All Metal Construction: The FlexiPunch-E features a heavy-duty all metal construction, including heavy cast side plates and non-skid feet. This machine paid for itself with just one job. The ease and accuracy of this machine is great. Saved many man hours punching them manually. And with the different dies I can purchase I'm sure the next job will pay for those as well. This punching machine is so wonderful. If you want to save stress on your hands and arms this is the way to go. I had previously used a manual punching machine by Akiles, and though this one is dramatically more expensive, it is COMPLETELY worth the extra dollars. It is so easy to use, straightforward, and right out of the box works flawlessly. I bought it with 4:1 coil die, and 3:1 wire die and it is sooooo easy to switch out the dies, and slide out the pins you don't want to punch. Adjusting the side margins is painless, and overall it is just spectacular and highly and easily customizable for the things that I make. I can't tell you just how much I love this machine over the manual machine. It is a beast, so you do want to set it up where you're most likely to use it, but as far as the amount of space it takes up, it's really about the same as the manual machine. The fact that I can punch about 15 sheets at a time might seem slow, but the effort I save my body is great, and it actually goes faster than you might expect, especially if you have everything organized in your workspace to streamline punching and binding. Welcome to MyBinding video. This is the FlexiPunch-E from Akiles. It doesn’t look like much like this and that’s because all the magic happens in the interchangeable die. There’s a total of 4 binding dies to choose from, all sold separately but swapping them out is almost ridiculously easy and on purchase you get to choose one die that you want. These are shipped in 2 boxes – one with the machine and one with the die. Keep in mind that this is a punching machine, so if you find yourself asking “what next?” you might want to consider a different machine but if you’re looking for a quick and easy way to make several different types of punches, then the FlexiPunch-E is a good machine to consider. We also have helpful how-to videos for each interchangeable die. And that is the Akiles FlexiPunch-E. For more demos, reviews and how-to’s, go to MyBinding.com. The Akiles FlexiPunch E is a heavy-duty electric binding punch that is designed to give you four different binding options. We took a look at this machine and compiled a list of what we consider to be its strengths and weaknesses. The FlexiPunch E is an electric punch, and as such has a really nice punching capacity of about 20 pages per cycle. The punching motor is very heavy duty, meaning that you will always have more than enough power to do the job in every punch pattern and die set. For those of you who are stepping up from a manual machine, you will find this process so much easier that you will wonder why you ever waited this long to upgrade. One of the great things about this machine is that it can be operated with a foot pedal. This means that you can hold the papers you are punching with both hands, which helps greatly with punch accuracy. The FlexiPunch E is big on versatility too. On this one machine, you will be able to do four different styles of binding: plastic comb, 4:1 wire coil, and 2:1 and 3:1 pitch wire binding. The die sets are very easy to change; you don't need any sort of tool, and the whole process takes less than a minute. All of the pins on the FlexiPunch E are fully disengageable. What this means to you is that you will be able to punch a bind all different sizes of paper without having to worry that there will be incomplete holes on the ends of your document. The FlexiPunch E also features an open throat design so that if you want to punch and bind documents that are longer than the 12" that it is designed for, you can accomplish that with a fairly easy two punch process. Another great feature of the FlexiPunch E is the adjustable depth of punch margin control. With this, you can always be assured that your documents are punched the proper distance from the edge of the paper as is appropriate for the thickness of the book. The depth of the punch and binding is important to the functionality and durability of the book. Thicker books should be punched further in from the edge, and thinner books more toward the edge. The FlexiPunch E has a really nice automatic anti-jam system that electronically detects a potential overfeed or jam, stops the mechanism and retracts the punching pins. This will save you a lot of trouble, not to mention the possibility of downtime due to a service call. The FlexiPunch E is a very heavy duty machine that is made of all metal, and would be seem to be made to last you a good number of years. That being said, Akiles offers only a one year warranty on this machine. Though as we stated before, the FlexiPunch E can be used to punch documents longer than 12" with a two-punch process. If you are going to be punching large amounts of documents that will need to be punched twice, you should be aware that you will be working a little bit more slowly than if you were punching and binding letter and A4 sized sheets. This system is capable of producing four different hole patterns. However, when you buy the machine it will only come with one punching die. You will have to purchase the other die sets separately. However, the good news is, the die sets are extremely reasonable in price. This system is just a punch and does not include a comb opener, wire closer or coil inserter. You will need to buy one of those pieces of finishing equipment to finish your documents.